A Vietnamese fishing boat has sunk after it collided with a Chinese vessel near a controversial oil rig in the South China Sea, amid tensions between the two nations. Both countries are blaming the other for the incident. Vietnam's coast guard said the boat was encircled by 40 Chinese vessels before it was rammed, reports said. But Chinese state media outlet Xinhua said Vietnam's boat collided with its vessel after "engaging in harassment". The BBC's Martin Patience says that whatever the truth, the sinking is likely to further escalate tensions between the two countries, given that for the past few weeks they have engaged in skirmishes at sea. The two are locked in an intensifying dispute over South China Sea territory. Vietnam has protested against China moving its Haiyang Shiyou 981 rig to waters also claimed by Hanoi, at a spot near the disputed Paracel Islands. Monday's incident happened just 17 nautical miles from the rig, Vietnamese reports said. Xinhua on Tuesday claimed that Vietnam had "on many occasions dispatched various boats with the sole intention of harassing Chinese-linked companies drilling in that part of the ocean". It said China had made serious representations to Vietnam to request that it "halt its harassing and destructive activities". Vietnamese media meanwhile reported that China deployed "a fast attack missile boat and a minesweeper" around the rig on Monday. China's refusal to move the rig sparked anti-China protests in Vietnam earlier in May, which left at least two people dead and several factories burnt. Vietnamese legislators are preparing to sue China in an international court over the rig and other attacks on Vietnamese ships, according to local media. 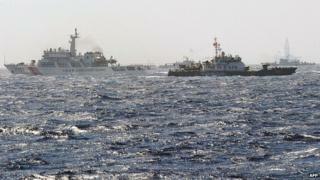 China in recent days has upped its rhetoric on the South China Sea. On Monday, a spokesman for China's foreign ministry addressed a recent attempt by Vietnam to list its historical claims to the Paracel Islands, saying it was "absurd and laughable". On the same day, Xinhua published a commentary in English which accused Vietnam of wanting to "disturb and play up the normal drilling of Haiyang Shiyou 981". Written by Chinese law professor Yang Zewei, the commentary states: "Hanoi should know that such drilling in the said area is China's sovereign right endowed by the United Nations Convention on the Law of the Sea." "Vietnam should immediately stop any interruptive activities and undertake corresponding consequences and international responsibilities for its provocations.". Japan has urged calm. Government spokesman Yoshihide Suga said it was important that "relevant countries abstain from unilateral actions that raise tensions". Meanwhile, Vietnam is preparing to prosecute "hundreds of suspects" involved in the anti-China protests earlier in May, and has already jailed two participants, according to local media. China has for decades claimed a U-shaped swathe of the South China Sea. But tensions have flared up in the region recently as China seeks to assert its claims in a more muscular fashion with a beefed-up maritime presence. Its actions have upset several neighbouring countries, including the Philippines - which is taking China to a United Nations tribunal.